SEMA has some really interesting information, if you are in the industry. This is just something I was thinking about the other day. 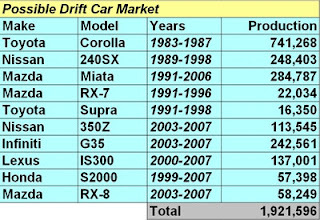 The Mazda Miata may be a popular drift car for the underground- non professional guys, but the RX-8 is not a popular car. Not enough power in the RX-8. Rod Millen tried to compete with one, and he didn't seem to have a lot of luck in it. Would that be imports to the US or world production? That is just US imports. World production would be higher.